ROM hacking is a fun, and possibly illegal way to breathe life back into those stale ROMs idly sitting on your hard drive twiddling their thumbs in boredom. In fact, you can take the worst game ever created; I'm talking about Dr. Jekyll and Mr. Hyde of course, and turn it into an enjoyable afternoon. 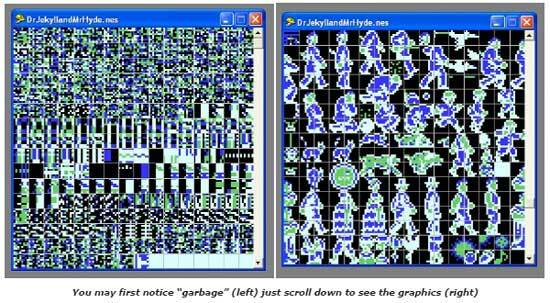 The majority of ROM hacking is done by editing graphics using a tile editor, and editing code using a hex editor. Since this article is meant for beginners, I'm going to discuss how to edit the graphics in a ROM. Editing graphics is pretty simple, and provides quicker results, then learning how to edit hex. However, if you really want to alter a ROM, you will need to learn how to edit the hexadecimal code. as long as its Tile Layer Pro. You can download Tile Layer Pro by visiting www.romhacking.net/utils/108/, and clicking the Download File Now link. The next thing youll need is a ROM. 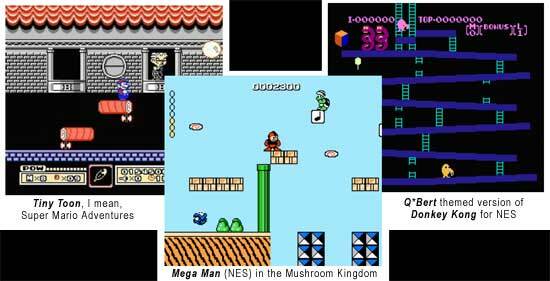 In this article, we will be using NES ROMs, though Tile Layer Pro is capable of editing ROMs for most of the 8 and 16 bit systems. In all likelihood, you already have a nice library of ROMs sitting on your hard drive; if not, I cant legally tell you where to get them, but if you Google it, Im sure youll figure it out. Last, you will need an emulator. I use Nestopia for my NES ROMs and it works fine. 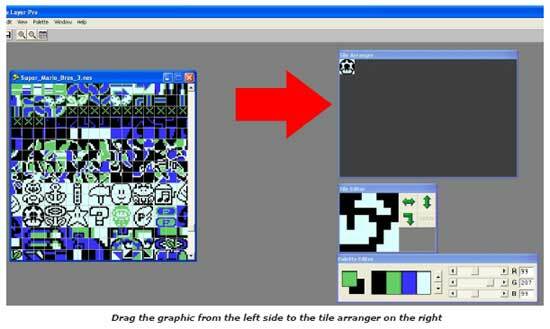 Much like the tile editor, there are several free emulators available. If you dont have an emulator, Google Nestopia, then download and install it. Before editing any of your ROMs, you should make a copy of them. Its a good idea to have one folder for unaltered ROMs and another for altered ROMs. This will allow you to have a copy of the original ROM when, I mean if, you mess something up. First open the tile editor, then go to File/Open, and select the ROM you would like to edit. You will notice that four boxes appear. The first box, lo-cated on the left-hand side of the screen, holds the graphics which are stored in the game. In all likelihood, the box you are looking at is filled with garbage, very similar to the white noise seen on a television. You are seeing this white noise because the tile editor is creating an image based on the data stored in the ROM. Simply use the arrow on the right side of the box to scroll down, and you should eventually reach images you recognize. You will notice that the graphics are stored in small squares called tiles. These tiles are usually made of 64 pixels, and contain four colors, one corresponding to transparency. You will also notice that the graphics may be stored irregularly. For instance, a characters head may be stored in one space, the arms and legs in another, and the body in yet another. This brings us comfortably to the tile arranger box. The tile arranger box lets you drag tiles to it, and recreate the image to make it easier to see. Try it out, just left click on a tile and drag it to the tile arranger box. You may select a tile for editing by left clicking either a tile in the box containing the graph-ics, or by left clicking a tile in the tile arranger box. When a tile is clicked to edit, it will appear in the tile editor box. The palette editor box will contain the colors you can use to edit the tile. It doesnt matter what colors are shown in the palette editor box, the actual colors that you would see when play-ing the unaltered game are the colors that are available to edit the tile with. The colors you see in the palette box are to make it easier for you to see, and do not correspond to the actual colors you will see when playing the game. To edit the image, simply put your cursor over the image in the tile editor and left click. This will change one pixel to the primary color selected in the palette editor box. If you would like to use a dif-ferent color, just left click the color in the palette editor box that you would like to use. To make a part of the tile transparent, simply right click the image, the secondary color is auto-matically set to the color used for transparency. You will notice that you can edit only one tile at a time. In order to change the tile, you are editing, just left click a different tile. Go ahead and try it out. 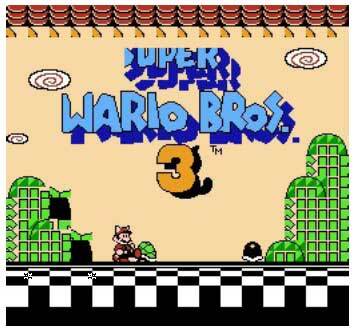 Super Wario Bros. 3. When you are finished go to File/Save, to save your altered ROM. Then play the ROM in your emulator to view the results! Tile Layer Pro will also allow you to import and export bitmap images. To export a bitmap image, right click an area in the graphics box and drag the cursor to select the tiles you would like to export. When you are finished, select Edit/Export Bitmap, and you will be prompted to save your selected tiles as a bitmap image. To import, go to Edit/Import Bitmap and select the bitmap image you would like to import. The image you have chosen to import will then appear inside the graphics box, drag the image to the tiles you would like it to replace, and then click elsewhere in the graphics box. The imported bitmap will then replace the tiles it is above. This is a handy feature that will allow you to take images from one game, and import them to another! I will warn you, if you try to do something silly, like import a bitmap image of your head to replace Megamans head, it will show up as white noise. The imported image must be stored in the correct bits per pixel (Bpp), which is 2Bpp for NES games. Also, it cannot contain more than four colors. Dont believe me? Go ahead and try it! Finally, no tutorial on graphical ROM hacking would be complete without this final note. Remember all the white noise I was talking about at the beginning of the article? That white noise can provide a bit of entertainment for the bored at heart. While youre in the tile editor, try rearranging some of the white noise. Since that noise is really game data, messing with it can have interesting, fun, and completely random results. Be sure you have a back-up of your original game, and your graphical hack if necessary, as messing with the data can render the game unplayable. Messing with the game data is called corrupting the game, and there are a lot of videos on YouTube devoted to this popular pastime. There you have it; you are now officially a ROM hacker! Okay, maybe its a little soon to call you a hacker, as you havent learned to edit hex yet, but at least you know something. If you would like to go ahead and get your hands dirty by editing hex, I would suggest visiting http://www.romhacks.net, they have several great tutorials for beginners that will teach you more advanced ROM hacking techniques, and they even have a graphic editing tutorial in case you need a recap.